Tiger PAWS (Parents Association Working for students) is 501(c)(3) non-profit organization committed to assuring Wheaton Warrenville South students have a well-rounded high school experience. Through fundraising and volunteerism, we provide support for academic achievement and school-sponsored teams, clubs and extra curricular activities of Wheaton Warrenville South High School. Are you a Booster Club or a PTA? Technically, we are neither. We are similar to a booster club; at Friday night football games you will see Tiger PAWS volunteers throughout Red Grange Stadium. Unlike a booster club, we also strive to enrich the academic experience at South. In fact, the majority of the money raised by PAWS is allocated to the math, science and languages departments. We are proud of the fact that we support each and every student at South. We are not a PTA . 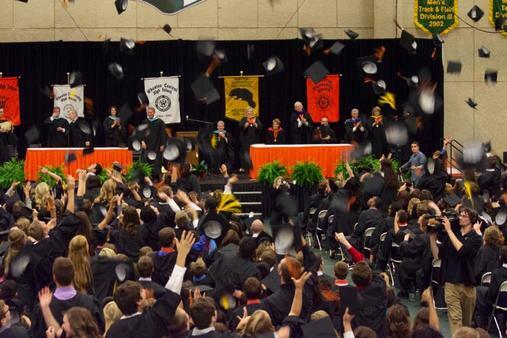 Since Wheaton Warrenville South does not have a PTA, Tiger PAWS performs many of the same functions of a PTA such as: raising funds for purchases for the school, provideingscholarships to students, providing snacks on testing day, providing awards for academic achievement, hosting a staff appreciation lunch,etc. You want your child to have a high quality educational experience. You recognize state and district funding does not provide enough for the school. Tiger PAWS provides the school with necessary funding. Parents like you make Tiger PAWS successful! My child is not in sports or extra curricular activities, why should I join PAWS? Our efforts support ALL areas of a student’s education. Contrary to popular belief, the academic departments (not the sports departments) receive the majority of our allocations. For example, we have provided funds for smart boards, white boards, computer tablets, ipads and projectors for the science, math, English and Special Services departments, printers and cameras for the art department, a piano for the music department, and document cameras for the PE department. We already pay an activity fee for my child’s sports/activity and my child has to go out and sell cookie dough, coupon cards, etc. Isn’t that enough? Activity fees and team fundraisers do cover the majority of expenses for a sport/activity/club. PAWS allocates money when there is a need or want above that exceeds normal expenses. Some examples are: stage risers for show choir, portable shelters for soccer, improved stadium sound equipment, finish line camera. Is there a way I can help instead of or in addition to paying membership dues? Absolutely. You can volunteer for one of our many committees.. Some positions require work throughout the year or a season. Other positions require as little as 1-2 days per year. There are opportunities during the day or night and during the week or weekends. Please consider attending one of our fundraisers, purchasing Tigerwear at one of our many sales and concessions at Red Grange Stadium. If you are a business owner, check out our sponsor page for a list of our advertising opportunities. Membership is $35. We also offer memberships with sports passes at an additional cost. Additionally, members may chose to contribute by becoming patron donors.